This software offers API (Application Program Interface) for acquiring data from waveform data files (WDF) saved on the measurement instrument. 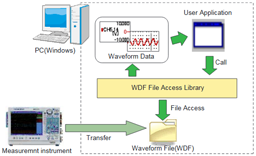 This software is the special library for waveform data files saved in WDF format. Please do not use for waveform data files saved on other measuring instruments. Can not load waveform data files saved in WDF format of newer version than the software. VisualStudio 2008 SP1 is required to use this software. Please install VisualStudio 2008 SP1 Redistributable Package, when VisualStudio 2008 SP1 is not installed in PC. Here is available for a previous firmware version.